Losing an eye, renders a person handicapped both physically and mentally, therefore, rehabilitating them, would significantly increase self-esteem because it no longer appears to have a disability. A patient named Narayan (alias) 72 years old, reported for Free Denture Camp at Kanakapura, Karnataka, conducted by the Department of Prosthodontics, Dayananda Sagar College of Dental Sciences, Bengaluru. On routine extraoral examination, it was found that the patient had lost his left eye 25 years back in an accident. Being from outskirts of city, he was unaware of the treatment options available and hence did not resort for any kind of rehabilitation procedures. As a result, the eye socket has considerably closed in on itself and eyelid drooped and did not function properly [Figure 1]. Furthermore, lower eyelid was thicker compared to his right eye [Figure 2]. Therefore, apart from rehabilitating the eye, another objective was added to increase the bulk of the globe, to match with the adjacent eye size and shape. 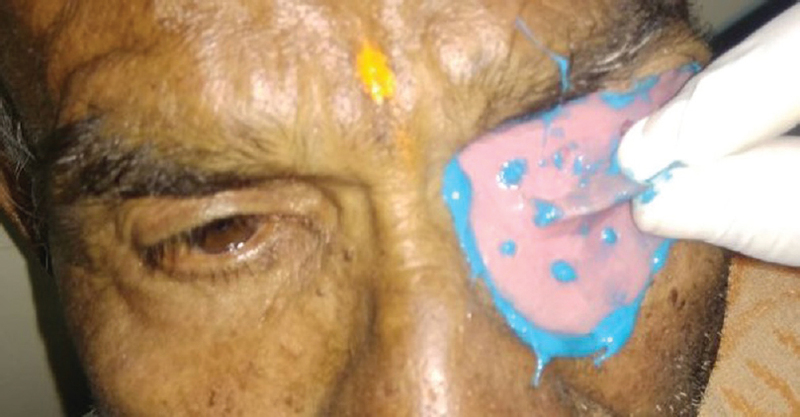 Hence, considering the clinical situation, external plate technique was decided for impression making and custom-made ocular prosthesis to be fabricated. After careful examination of the defect, treatment plan and procedures involved was explained to the patient to gain his cooperation. Informed consent was obtained for commencing the treatment and for making photographic records. The patient was seated in erect position, to record the impression of tissues involved in the defect in relaxed position during active posture. The defect was anesthetized with topical ocular esthetics for 10 min. Petroleum jelly was applied to the eyebrow and cheeks and along the bridge of nose for easy removal of impression. 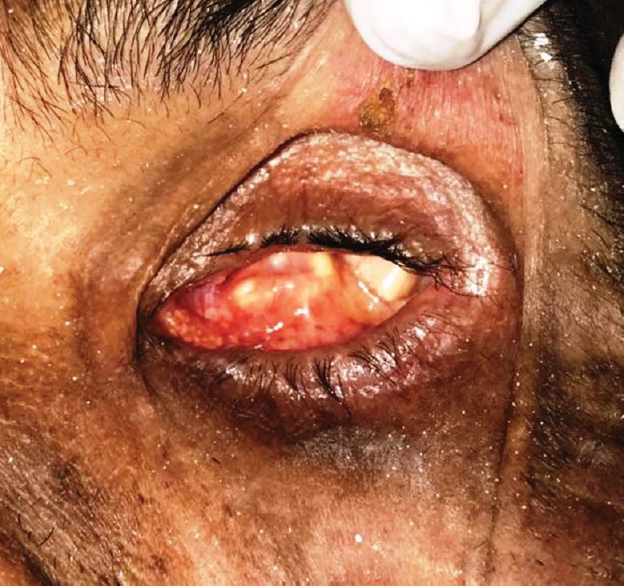 The patient was instructed to gaze on to an object placed 6 feet far below the horizontal eye level to record the periocular tissues and muscle position in an unstrained fashion. The primary impression was made with alginate supported by a base of Plaster of Paris [Figure 3]. 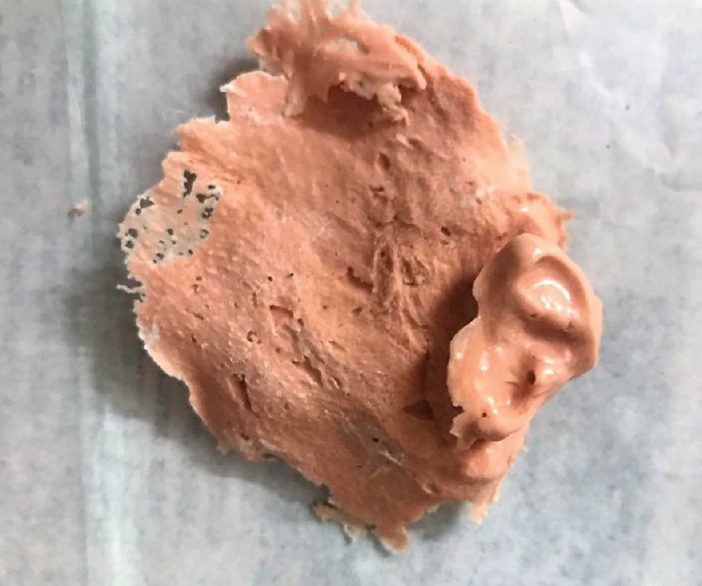 The alginate was loaded on to 5-ml syringe (without hub) and was expressed into the eye socket and flown externally involving eyebrows, cheekbones, and the bridge of the nose [Figure 4]. The impression was boxed with boxing wax, and primary cast was poured with dental stone. With the stone model as a template, external plate was fabricated using self-cure acrylic. The plate was vented using straight fissure burs, and a handle was attached to it. This external plate is now used as a custom-made tray to express secondary impression material (low viscosity) into the socket and record the intrasocket space in detail. 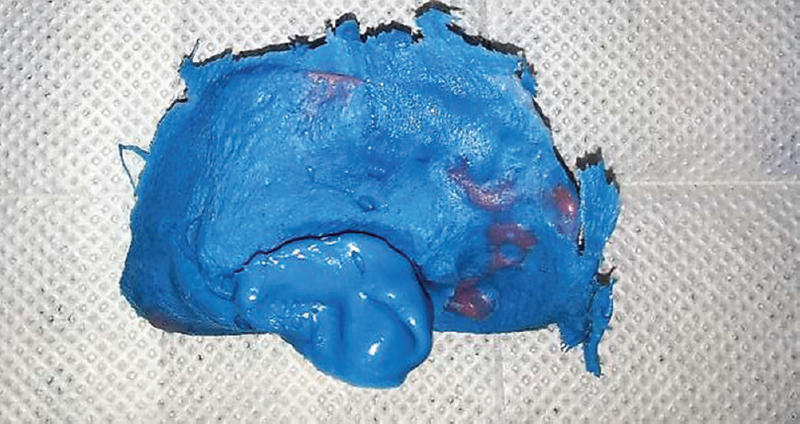 Low-viscosity elastomeric impression material is injected into intrasocket space with 5-ml syringe and was backed up with custom-made external plate [Figure 5]. The secondary impression was poured with dental stone [Figure 6]. Wax is melted and poured into the socket space and was allowed to cool. The wax pattern was then retrieved by sectioning the stone model. Clinically, the fit of the wax pattern was checked, and modifications were done to increase the size of globe and achieve a better fit [Figure 7]. The wax pattern was then acrylized with sclera resin, and again, trial was done. At this stage, the patient is instructed to gaze exactly straight to the operator's eye, such that we could obtain the correct pupillary position. The position of the iris is marked with marker [Figure 8]. The equidistant positioning of the iris was rechecked by coinciding the midlines of the patient with the marking from iris to the midline on a transparent sheet. Then the iris is painted over the sclera resin pattern with the pupil positioned to its geometric centre. Characterizations like shade matching and specific anatomic details was added using acrylic colours and stains. Finally a thin layer of clear acrylic is flushed over the resin to complete the prosthesis. The final fit of the prosthesis was checked for fit, contour, and movements and was delivered to the patient [Figure 9] and [Figure 10]. 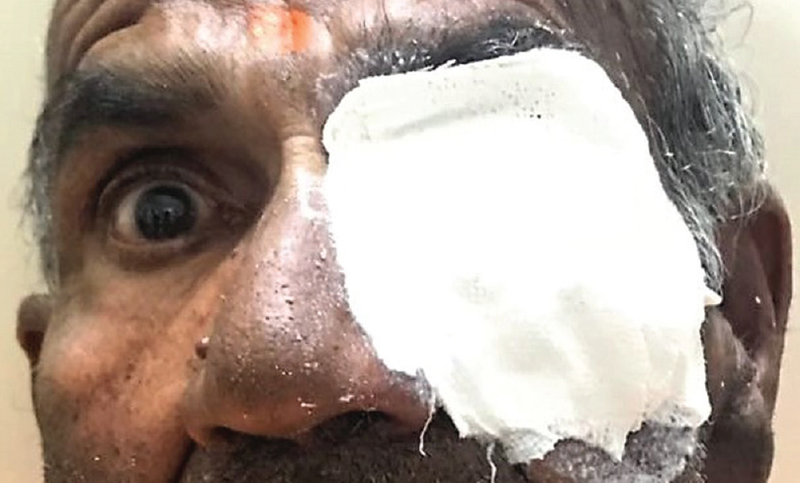 The patient was without any replacement of his lost eye for more than 20 years; as a result, the socket dimension was closed, and the eyelids collapsed. In such cases, the use of conformers would not be of much help; therefore, external plate technique was chosen for impression making which involved detailed impression of the socket, eyelids, and surrounding associated tissues of the defect. The custom-made ocular prosthesis accurately confirms to the socket on the existed anatomy of the patient giving added benefits of increased adaptation, movement of the eyeball, and exact position of the iris as that of the adjacent natural eye. A technique for fabrication of custom-made ocular prosthesis using external plate technique for impression making has been described. The final prosthesis fabricated provided sufficient bulk for the globe with satisfactory internal adaptation to the tissue bed and equal distribution of pressures within. Follow-up was done, which revealed increased confidence and self-esteem, which, however, further aided in the patients rehabilitation process. The authors certify that they have obtained all appropriate patient consent forms. In the form, the patient has given his consent for his images and other clinical information to be reported in the journal. The patient understands that his name and initials will not be published and due efforts will be made to conceal their identity, but anonymity cannot be guaranteed. Guttal SS, Joshi SM, Pillai LK, Nadiger RK. Ocular prosthesis for a geriatric patient with customised iris: A report of two cases. Gerodontology 2011;28:152-6. Beumer J, editor. Maxillofacial Rehabilitation-Prosthodontics and Surgical Considerations. St. Louis (MO): Isiyaku Euro America Publication; 1996. Bartlett SO, Moore DJ. Ocular prosthesis: A physiologic system. J Prosthet Dent 1973;29:450-9. Mathews MF, Smith RM, Sutton AJ, Hudson R. The ocular impression: A review of the literature and presentation of an alternate technique. J Prosthodont 2000;9:210-6. Jorge JH, Giampaolo ET, Vergani CE, Machado AL, Pavarina AC, Carlos IZ, et al. Biocompatibility of denture base acrylic resins evaluated in culture of L929 cells. Effect of polymerisation cycle and post-polymerisation treatments. Gerodontology 2007;24:52-7. Kelley KV. Polymerization of poly-methylmethacrylate (PMMA) artificial eyes. J Ophthalmic Prosthet 1998;3:11-29. Cain JR. Custom ocular prosthetics. J Prosthet Dent 1982;48:690-4.